Sacramento, CA – Members of the Service Employees International Union (SEIU) in California praised California’s leadership in establishing a voluntary retirement savings plan for millions of private-sector, home-based and self-employed workers. The Secure Choice plan signed into law today by Governor Jerry Brown will make more than seven million Californians eligible to save for retirement through payroll deductions, with accounts that follow them throughout their working years. The significance of this new approach to retirement security is enormous – the Secure Choice plan will make retirement savings possible for millions of Californians for the first time in their lives. Access to a simple, automatic retirement savings plan is crucial to head off a projected tsunami of senior poverty that will take its biggest toll on women, Asian Americans and Latinos who are a growing share of future seniors. California’s senior population is rapidly growing, with seniors age 80 and older, Latinos, and Asians, and women estimated to continue to make up a majority of seniors. These are populations that tend to have fewer resources in retirement. Three out of ten seniors in California do not have enough income to cover their basic needs. Older seniors, seniors of color, older women, unmarried seniors, and renters are more likely to be poor and to struggle to meet their basic needs. “SEIU members believe the dignity of retirement should be available to everyone who works hard throughout their lives,” said Yvonne Walker, President of SEIU Local 1000 and Chair of SEIU Retirement Security Committee. 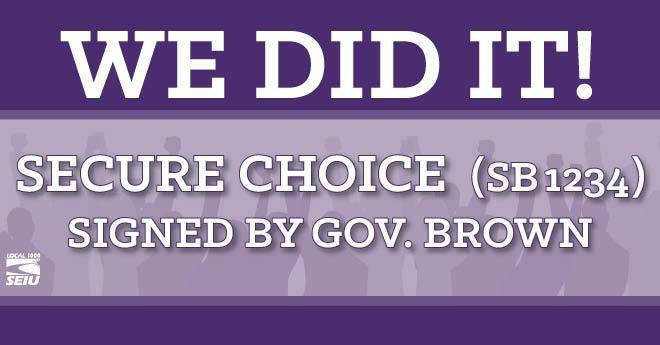 “The Secure Choice plan is a turning point in the history of our state – and our 700,000 members are proud to have fought for a plan that closes the income gap for all seniors. The California Secure Choice Retirement Savings Investment Board will meet in October to begin discussing the key steps to setting up the plan. First steps will include partnering with public entities and firms to establish the capacity to enroll and track participants at the scale required in the next few years. The plan may begin accepting contributions in the next two years.